Stuffed bell peppers make a delicious everyday meal with a tossed salad and mashed or baked potatoes. The filling in this classic version includes ground beef and rice. Because the ground beef is not browned before it's added to the peppers, it should be quite lean (85/15 to 90/10). Replace the ground beef with ground turkey thighs for a lighter option. This tried-and-true recipe is a family favorite, and many people consider the dish a comfort food. 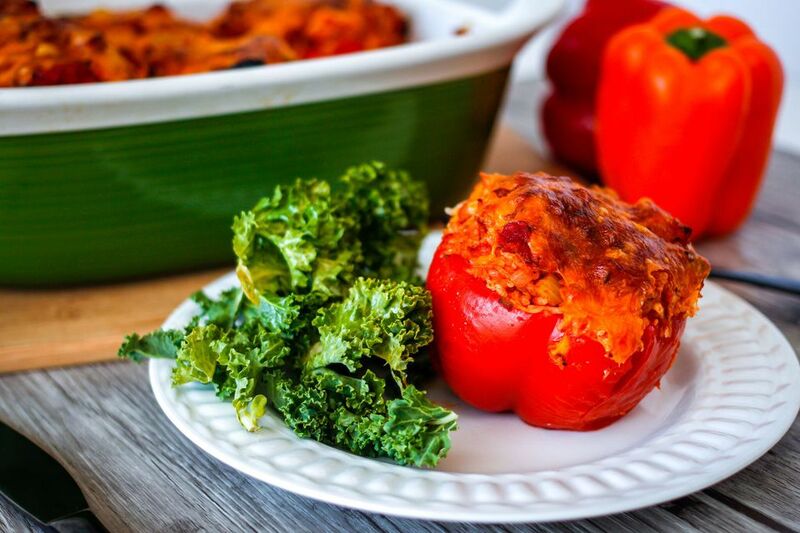 Make these easy stuffed peppers and find out why the dish is so popular! Cut the tops off of the bell peppers and rinse them under cold water; remove seeds and cut away the white ribs, which might be bitter. Chop the edible part of tops and set aside. Place the peppers in a large pot and cover with salted water. Bring to a boil; reduce heat, cover, and simmer for 5 minutes. Drain and set aside. Heat the olive oil and butter in a large skillet over medium heat until the oil is hot and the butter is foamy. Sauté the chopped bell pepper (from the tops), chopped onion, and chopped celery for about 5 minutes, or until vegetables are tender. Add the (undrained) canned diced tomatoes, tomato sauce, crushed garlic, oregano, basil, 1 teaspoon salt, and 1/4 teaspoon of pepper. Bring to a simmer and cook for about 10 minutes. In a large mixing bowl, combine the egg with the remaining 1 teaspoon of salt, 1/4 teaspoon of pepper, and Worcestershire sauce. Gently stir to blend; add ground beef, cooked rice, and 1 cup of the tomato sauce mixture. Mix well. Stuff the peppers loosely with the ground beef mixture and place them in a 13-by-9-by-2-inch baking pan. Pour the remaining tomato mixture over the stuffed peppers. Bake the peppers for about 45 minutes, or until the meat mixture is thoroughly cooked. To ensure the peppers are thoroughly cooked, insert an instant-read thermometer into the center of a stuffed pepper. The minimum safe temperature is 160 F for ground beef, pork or lamb, or 165 F for ground turkey or chicken. The peppers may also be halved horizontally so you have two halves to fill. You won't have the extra chopped pepper from the tops, but you can chop an extra bell pepper. Top stuffed peppers with a small amount of shredded cheddar cheese just before they are done and then return them to the oven and bake just until the cheese has melted. Use green bell peppers or red bell peppers, or any combination of colors. Ground turkey or ground chicken may be used to replace all or part of the ground beef in the recipe. Or add some extra-lean ground pork to the ground beef.